In September 2019, author Gill Blanchard will host the first Family History River Cruise in association with Family Tree magazine. Throughout the cruise, Gill will host several sessions and interactive activities on topics including essential records, information about DNA testing, how to use online resources, visiting archives and your next steps! Find out more via www.family-tree.co.uk. You'll be £12.99 closer to your next £10.00 credit when you purchase Tracing Your East Anglian Ancestors. What's this? Gill Blanchard's practical and informative handbook will help you to trace your ancestors in the traditional counties of East Anglia - Norfolk, Suffolk, Cambridgeshire and Essex - and it will give you a fascinating insight into their lives. As well as guiding the researcher to historical records held in all the relevant archives, she explores the wealth of other resources that add the 'flesh to the bones' of our ancestors' lives. She describes how fascinating information can be discovered about the places they lived in and the important historical events they lived through, and she traces the life stories of notable people from all backgrounds who shaped the region's development over the centuries. Her account highlights East Anglia's diversity but also focuses on its common features and its strong sense of identity. She starts with a general introduction to its history and geography, then goes on to focus on different aspects of its rich past. In the process she illustrates a wide array of additional research resources that will be revealing for readers who want to find out more about all aspects of life in this area of England. 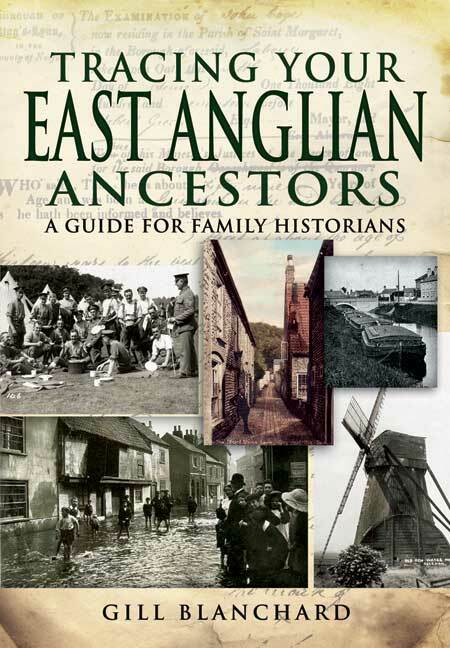 The guide to East Anglian ancestors by Gill Blanchard, an experienced family and local historian...attempt[s] to direct genealogists beyond the basic records by providing them with a general account of the region...topic by topic, and by noting the variety of records that are available for research. This is a book for those who have constructed a family tree and now want to put some human flesh on dried bones. A very readable guide to research in East Anglia which also gives a history of the area. although aimed primarily at those interested in East Anglian ancestors has much to offer the general reader with an interest in genealogy and is of use both to the beginner and the more experienced researcher. What I liked especially was that each chapter had sections on where to go to find out more about each subject and where to visit to bring it to life e.g. museums and exhibitions. Gill is a professional genealogist, house historian, tutor and author based in Norwich www.pastsearch.co.uk Gill has run a family history, house history and local history research business since 1997, and worked in a local record office for six years before that. Her academic background is in history, sociology (BA Hons.) and international relations (MA). She has had several guides, local histories and biographies published and writes regularly for national genealogy magazines. Gill is a full member of AGRA - the Association of Genealogists and Researchers in Archives. Gill has also undertaken many research projects for authors, academics, journalists and television production teams, including the BBC’s Who Do You Think You Are? She appeared on the Mary Berry episode of this show in 2014 and will appear again on an episode in 2018. Among other organisations she has worked for are local architects, property developers and solicitors, hotels and pubs; New England Historic Genealogical Society in America; Customised Heritage Tours in Australia; English Heritage; Zetica Ltd.; The Mail on Sunday newspaper; J.D. Weatherspoons and the Department of Demography at the University of California, Berkley.